Francesco Vitale at Nauta Yachts calls to say that the owner of the classic 26m motor yacht Nadir II just this afternoon authorised a €100,000 price reduction. A gentleman's yacht built by Benetti in 1973 and regularly maintained by a fastidious owner, she's RINA classed and MCA compliant. Accommodation is for up to eight guests in a master suite and two twin staterooms, each with a Pullman berth, while twin GM 390hp engines give her a range of 1,600 nautical miles at her cruising speed of 10 knots. 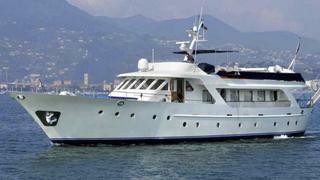 Nadir II is now down from €850,000 to €750,000.